Hello to all our readers out there! Today, I'm introducing a game called "Plants vs Zombies" by PopCap, some of us may be familiar with this game and game-play in the PC form but do you know that now you can play this game on your iPhone whenever you want? 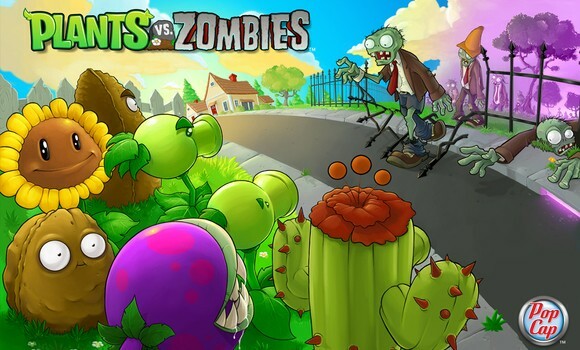 PopCap released this game on the iPhone platform for those die-hard fans of "Plants vs Zombies" the game is no different from the one on PC. In this game, you need to protect your house from approaching zombies and what better ways are there to protect your house other than using your beloved plants to fight them off? With a large variety of plants and zombies, such as the peashooter plant to attack the zombies, sunflower to collect sunshine and the zombie who looks startlingly like Michael Jackson dancing his way to attack your house, this game will keep you entertained for hours on end while you go through level after level of increasing difficulties. Being a fan of this game myself, I would definitely recommend this game to others. However, there is one downside to this game, it's price. With it being priced at a hefty $3.98 in the app store, it is on the high end of games. My advice to people who really want this game is to wait till a sale where the price of this game may go down to as low as $0.99! Well that's all for today folks! Be sure to check back on Wednesdays for more iPhone game updates. This is Dennis "the menace" Lee signing off. p.s for those people who have no idea what this game is about and have not heard about it, here's a video to show you how the game is played. Wow, great to know this game is also available on Iphones now. I hope to check out this game and play it to have good fun. Plants vs Zombies! :D One of my favourite game! I like this game very much. Good for passing time. sadly, it's not free on phone. This is definitely worth your money Kathleen! However, I encourage you to wait for the game to go on sale and get it at a cheaper price.